Our web today is a wonderful place. It's increasingly become a knowledge hub for strollers around the globe. And you know what the best part is? It does not have a religion, race or color, that's where perhaps its strength lies in. Point being, no matter what you are after, from details of products to how to use them, from fruit varieties to language origins, from how to hack Facebook account to how to set up a custom domain name in Blogger. Each and everything is there, in abundance and easily available. 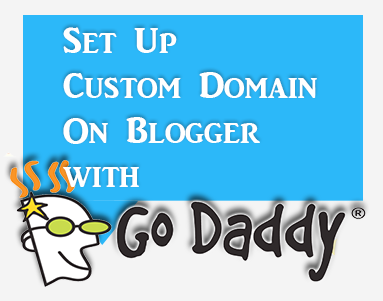 Now I know you are here to understand how you can setup/host your custom domain on your Blogger account. So let's get on with it, without further delay. It's important that you realize, it isn't difficult to add a custom domain into your blogger account. If you are a blogger, it's perfect if you already own your own blog, it shows your passion and love for blogging and provides you with freedom to move from one platform to another, when and if you need. Also from users perspective, it's much easier for them to remember and visit your blog at customized address like myblog.com than myblog.blogspot.com. One of the best things about Blogger is that it does not push you to host your site with blogger. It is entirely your own choice to choose from either of two hosting plans 'hosting on BlogSpot' with address myblog.blogspot.com, or going with a custom domain with address myblog.com. So now if you have bought yourself a domain, from either of these you would have an IP address and a name. Let's assume our is 'mynewdomain'.com. Well, it's time to start adding a custom domain to your blogger account. Here we are using setup for GoDaddy.com, the most popular domain name provider. 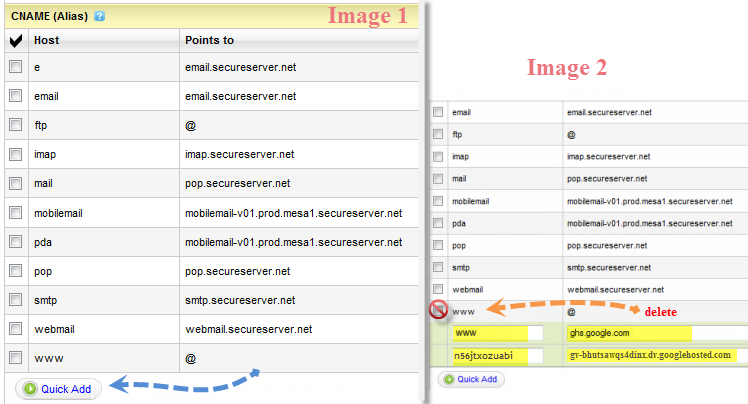 For custom domains from other sites, the steps are almost same, so don't vanish. Step 1. Login to your Blogger account at www.blogger.com. Step 2. Click on your blog and then go to "Settings", choose "Basic". Step 3. Under "Publishing" section, click "+ Setup a 3rd party URL for your blog". Step 4. Under "Third-party domain settings" next to "http://" type your domain that you just purchased and make sure that you don't forget to add the "www" prefix to the domain name. Step 5. Click "View settings instructions" to get the blogger's official instructions. On the Blogger instruction page, choose the "On a top-level domain (www.example.com)" option. Step 6. Under the point 9 of instructions, 4 IP addresses will be given, copy and save all 4 of them. Step 8. Under the error, you will see two fields "Name, Label or Host Field" and "Destination, target, or Points To" field. Copy data of both rows from these fields. Step 9. Now log in to your GoDaddy.com account and click on "My account" on the upper right corner > select "Manage my Domains". Step 10. Here you should see your purchased domain name > just click on your domain name. Step 11. Click on the "DNS Zone File" tab next to Settings and choose "Use Classic DNS Manager". Step 12. Next, click the "Edit" button to edit your DNS Zone File. Step 13. Under the "CNAME (Alias)" menu, click "Quick Add" button at the bottom of the screen (see image 1 in the below screnshoot). Step 14. In the Edit box that now appeared, enter "www" in the first box and "ghs.google.com" in the second. Step 15. Click "Quick Add" again and enter details from second row of the data we saved in step 8. Step 16. Under the "A (Host)" menu, again choose Quick Add (see the below image). Step 18. Add all 4 of them one by one and delete old host as you won't need it anymore. Step 19. At the top of the page, click on the "Save Zone File" button to save your setings. Step 20. Now go back to Blogger and try to save settings again. The registration process takes 24-48 hours, so don't worry if you get an error again. Come again later to Blogger after 24-48 hours, repeat step 2 to 4, press Save and the error should be gone. Step 21. After your URL starts working, click on the "Edit" link next to domain name on setting page. Step 22. Check the "Redirect... to..." checkbox below your site address to ensure that even if the visitors will miss out the www part, they will still be able to reach your site. Step 23. And that's it. Enjoy your new URL! So this was easy, right? Only a handful of steps and we have successfully completed our mission of adding our custom domain in our blogger account. In case you haven't yet, stay patient wait for 2 days and try again. Or repeat steps 1-22, and make sure you don't miss any. Otherwise your new URL is ready and all set to roam around the wonderful world of web.